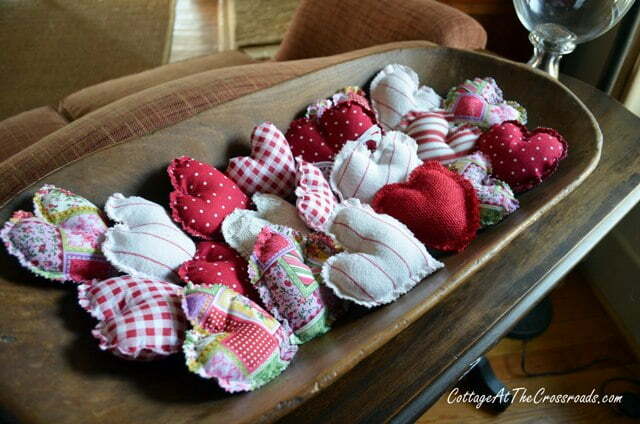 I was thinking that the house looked a little bare after taking down the Christmas decorations, so I decided to make some easy fabric hearts to add some color and to get ready for Valentine’s Day. I tried to go with a winter theme by leaving out some of my decorated and painted pine cones, but it’s awfully hard to get that winter feel when the temperatures have been almost 80 degrees for the past few days! 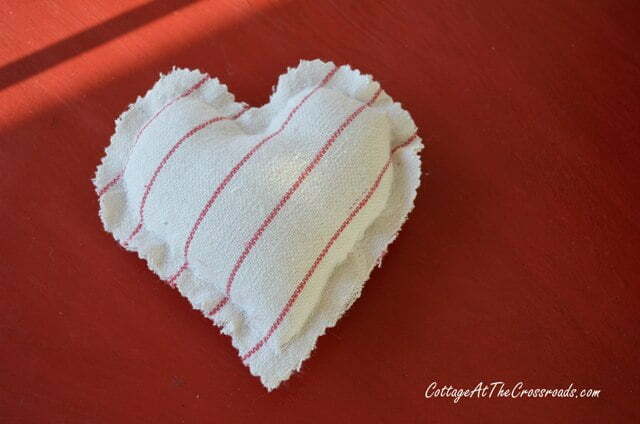 And since I was craving some color, I made a bunch of these easy to make fabric hearts! 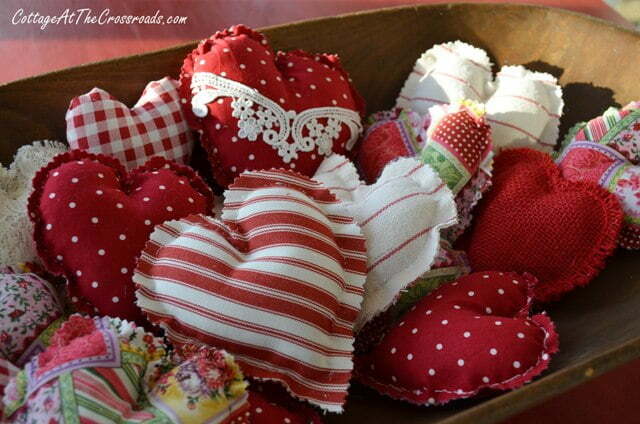 These hearts are easy to make because you don’t need a sewing machine! Don’t they put you in the mood for Valentine’s Day? 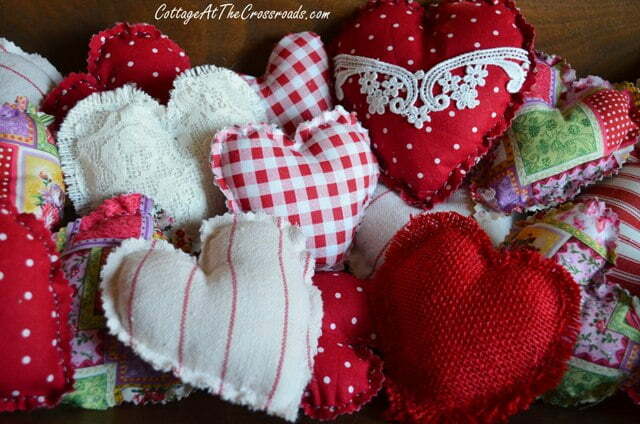 To make these hearts, you will need an assortment of fabrics. I used some red and white burlap that I had left over from some other projects, a tea towel, and a few new fabrics that I bought at Hobby Lobby. First, I cut out a heart from paper to use as a tracer. Then I marked and cut out some squares of fabric. I made my squares 5 1/2 inches by 5 1/2 inches. Don’t forget to double your fabric because you need a front and back for your hearts! 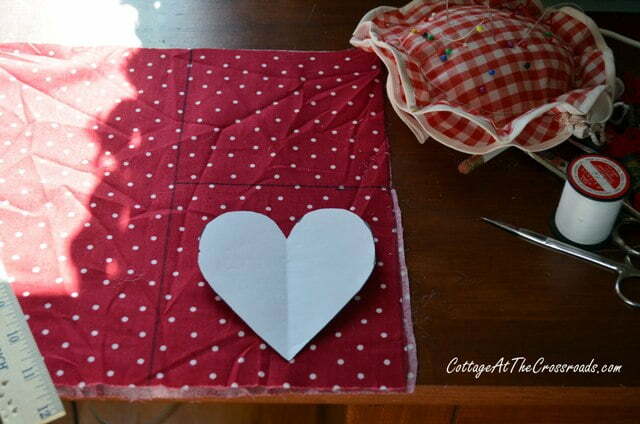 Trace around the paper heart onto your fabric. I used a pen to lightly trace mine onto the fabric. Then I hand-stitched around the heart, leaving a hole so that I could stuff some polyfill into the heart. After I stuffed it, I finished sewing up the heart. You can see that process a little better in this photo! 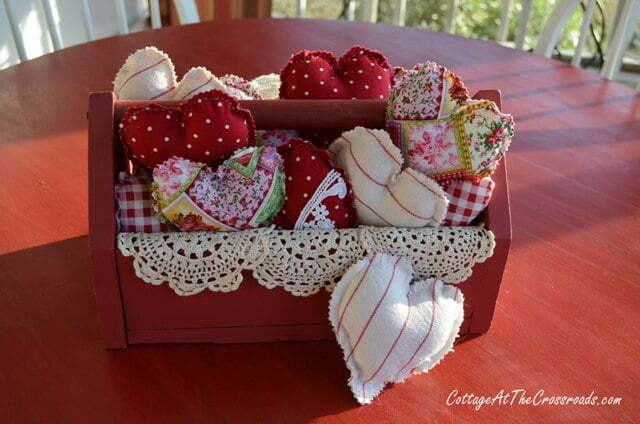 When I made some hearts from burlap, I used embroidery thread since it is much thicker, and I stuffed the red one with an old, fuzzy red sock! To finish the heart, I cut around the edges with pinking shears. They look great in my dough bowl! I embellished one of the hearts with a little lace, and I even started making some different sizes. There was something very comforting about hand stitching these hearts, and I was thinking that this would be a great project to teach young ones how to sew. Of course, I had to see how they would look in my little red tool box hanging out on my red table on the front porch. So cute, so I’m off to the store tomorrow to buy a few buttons and other things to do some further embellishing. 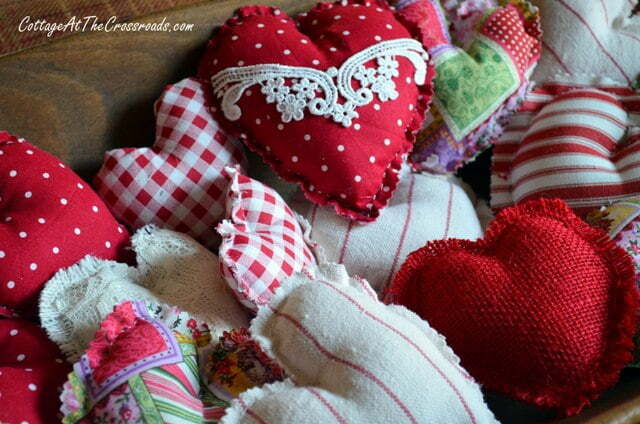 And I’m thinking that I’m going to make some more of these easy to make fabric hearts! Thanks for sharing. I’d love to make some heart ornaments for my family in memory of a loved one. I am new to sewing though. What type of stitch do you do for this? 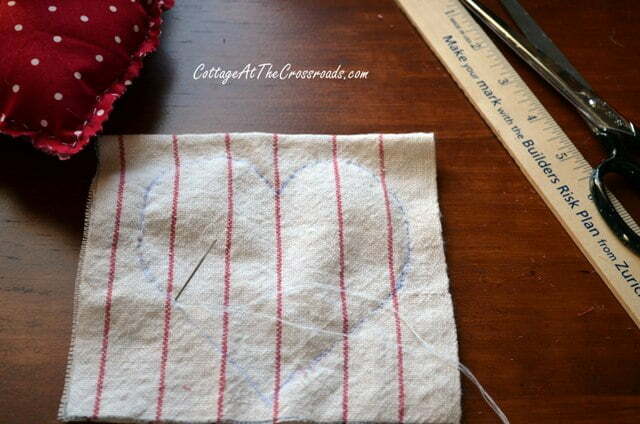 Stefanie, I use a basic running stitch when making the hearts. If you are unsure how to do that, look for a video on YouTube. I just looked up, there is a water soluble marker. Before I fill, I can wash it. I love these! I think I will use them for my daughters to learn/ practice their sewing. They are almost 6 and 10. What a fun and festive project! Thanks for sharing! You’re right! 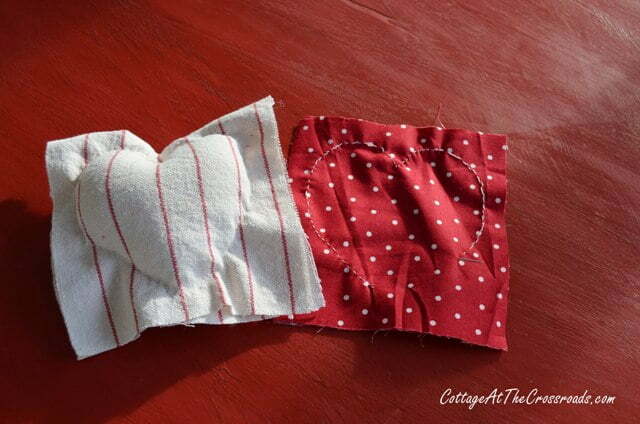 This is a perfect project for teaching someone how to sew! I can’t see where to leave an original comment just a reply…sorry! Anyway I see you trace the heart shape onto the fabric using a blue pen. But wouldn’t you be able to still see that tracing even after it is sewn? Am I missing something? Thanks for your tutorial! Your stitches will cover most of the tracing. Or use a pen with disappearing ink when it’s ironed, or chalk. How do you get the ink mark out? These are adorable and are a great “stash buster” for scraps that I think are too big to throw away! I made these fabric hearts for our daughter’s wedding last September (2016) and everyone loved them! I made little tags on them that said “Thanks for joining us for the best day of our lives! 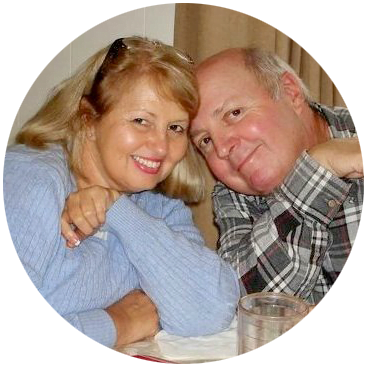 Rebecca and Philip, September 17, 2016.” Everyone loved them. They were such a hit, I made more for my close friends with Christmas fabric as gifts; and then, while I was on a roll, I made some for Valentine’s Day with cute “hearty” fabric. I have to say I absolutely love these. Thank you for sharing your talent with us Sunny Shuping. Que c’est joli et simple à la fois ! Merci pour cette chouette idée ! It is so nice and easy ! Thanks a lot for such a beautiful idea ! These are really cute and easy,what a brilliant idea. Thank you. Love the way you displayed your little hearts in the dough bowl on the table. I have been making felt hearts, I made some for Christmas. I made mine with holly leaves and buttons for berries. I put a white stitche4d snowflake on my girlfriends, stitched with wool, to give it that Scandi look. I make mine while watching tv at night, to keep my hands busy, so they are not into chips or popcorn! 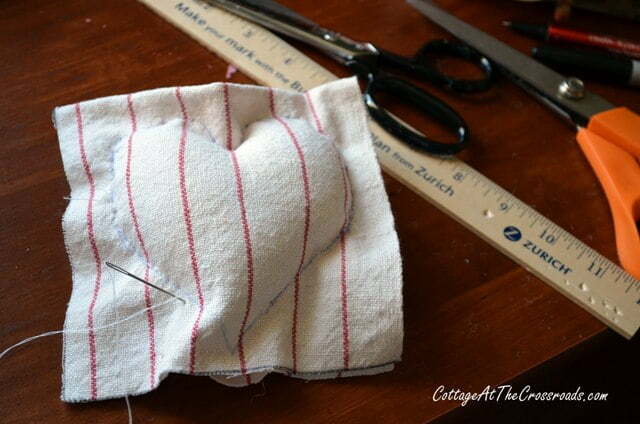 I like that you cut the heart after sewing which will work well for the fabric ones. I am inspired to make the cloth ones now after seeing yours! I use a rotary cutter with a pinking blade on it to cut mine as I have a difficult time with pinking shears, tendonitis in my hand and wrist. While you have 80 degrees we are hovering around zero and it is snowing like crazy. We have more snow than in 37 years! Maureen, I would have to find something to occupy myself if we had all that snow, too! And thanks for sharing that great idea of using a rotary cutter to cut out the hearts! This is such a fun project and I think I’ll begin with the hearts and maybe add them to a wreath! Thank you for your excellent directions and photos. I hope to make some this weekend. All I have to do is borrow a pair of pinking scissors. Your hearts are adorable, I’m inspired and think even I can make these. Thanks so much! Love these! Thank you ! I needed something creative to do for Valentine’s Day and your post fit the bill. Love this! Have a beautiful weekend! I love how you made your hearts. so easy and something you can do anywhere. thanks for the tutorial. These are adorable! I’ve been trying to come up with a special party favor idea for my daughter’s 13th birthday tomorrow afternoon…I wonder if I could get 12 of these made today? Ha! Beautiful! I’ve got a link up going, if you’re interested in showing off your project to my readers! Thank you for posting this. I have 3 girls (9,9, &7) and I think this is the perfect project for them to work on their beginner sewing skills! Can’t wait to enjoy this with them. I love you adorable hearts. And I just found your blog. I’m a new follower and looking forward to visiting again. Thanks Jane…just what I was looking for. I’m your new follower! Hope you’ll visit me too. Hi Jane! Your little hearts are so very cute! I want to make some. Are you and Leo coming back to Haven in August? I hope so. I saw your post over at Savvy Southern Style. I Heart these! Wish I could sew! The striped one reminds me of grain sack and they look great all piled up in that dough bowl. These are so stinkin’ cute, Jane! I especially love them in the dough bowl. Very pretty, Jane! The house does look so bare after all the Cmas things come down. Jane, these are cute little hearts! Those are so cute! What a fun project. I love the combination of fabrics. These are adorable Jane! I love your combination of fabrics and cheery colors! I’m in desperate need of color and sunshine with all our rain! Perfect little hearts for bowl filling. Cute. Such sweet little hearts and so easy to make. Love the little hearts! So sew cute!! These are so colorful and fun. What a great project, Jane. SO cute!! Thank for sharing!! What a brilliant idea! The fabric is very cheerful and brightens up your spirits time of year plus Valentine’s Day is just around the corner. It’s a nice and easy and you don’t have to have a sewing machine. Those are adorable. I love that you don’t have to sew them inside out and figure out how to flip them around and then baste them. So much easier! Oh my gosh…I love them all laid out in that dough bowl! Brilliant too that you trim after you have finished the heart. Thanks for your comment on my weight loss post. At our age trying to stay fit is almost like the impossible dream. It’s just so hard. Go0d luck with whatever you have planned! I almost forgot…I agree about stitching something by hand. It is very comforting! Oh my goodness! I love these! I want to make a whole basket full of them! Thank you for the great tutorial…..I’m inspired! These are so cute! Now I have got to go get my fabric stash out and try this. I made a couple of burlap hearts using the sewing machine. I think I’ll try your way! That’s a wonderful idea! I love the edges cut with pinking shears! They’re adorable. I have a thing for hearts. I love these. I really like them in the red box with the dollies. So cute. Those are so darn cute! Cheerful too! How pretty! 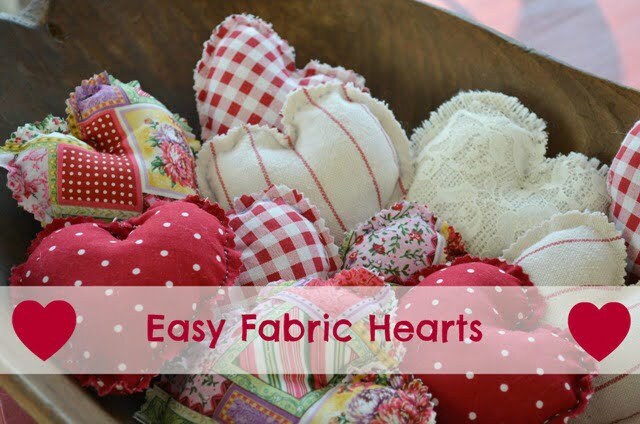 I love all the hearts and all the different fabrics and patterns! So cute! Jane, I love how your cheerful hearts fill up the dough bowl. Fun fabric choices…beautiful! Very cute Jane! I love how colorful they are. And thansk for the tutorial. I’ll definitely have to go through my fabric and try these. Your hearts are stunning, and adorable. Thank you.